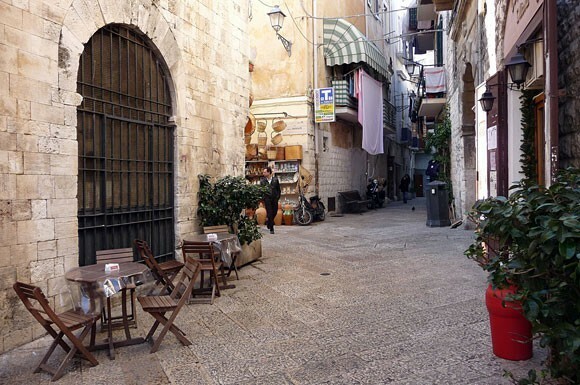 As well as the Itria Valley with its trulli and its white towns there are plenty of other places, sites and cities that are worth a day or an afternoon getting to know. Here are a few brief descriptions of some of the more interesting ones to visit. For some more than others, we recommend hiring a tour guide, so that you can really get to know the hidden treasures within. 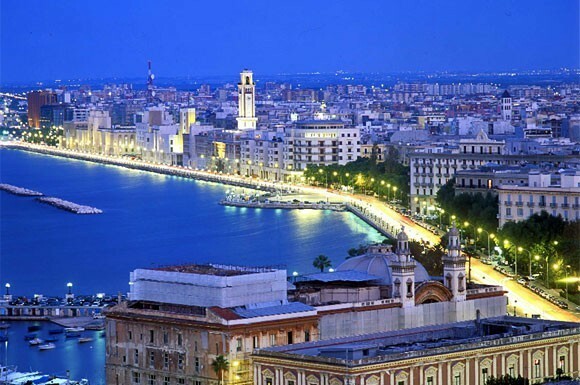 The capital of Apulia stands on the Adriatic Sea. 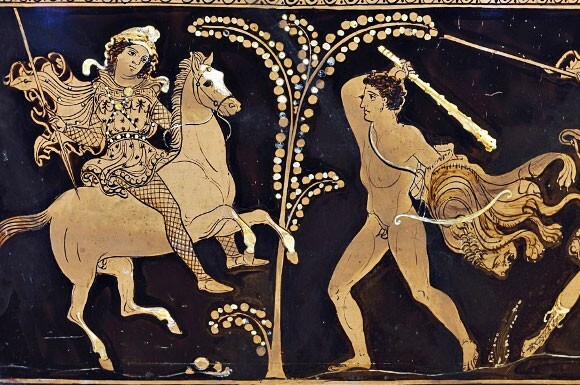 The first settlement dates back to around 3000 years ago, and it formed part of Magna Graecia in the 8th century BC, later being dominated by Roman, Longobard, Byzantine, Arab, and Norman invaders and by the Swabians under Emperor Frederick II. Traces of all these dominations can be found, especially in the old city. A promontory of rock jutting out into the sea, where the life of the city took place until the early 19th century, the atmosphere of the old city is pure Orient, a maze of alleyways and narrow streets, with squares both large and small, entrancing the visitor in as if to a kasbah. 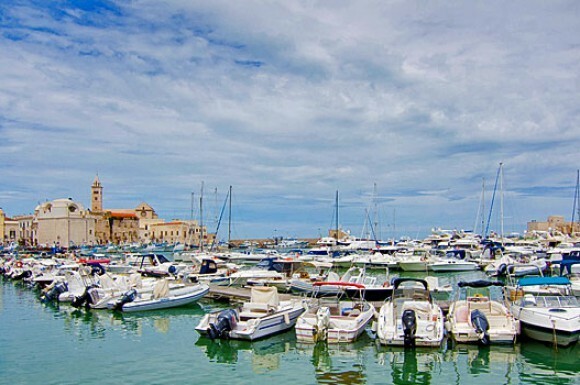 The old city is protected from the sea by ancient fortified city walls, where waves used to lap until the 1930s, and which provide enchanting views of the old port. Access is from the seafront road which skirts the ancient walls, or from Corso Vittorio Emanuele, one of the oldest main streets in the new city, which used to lie outside the city walls. 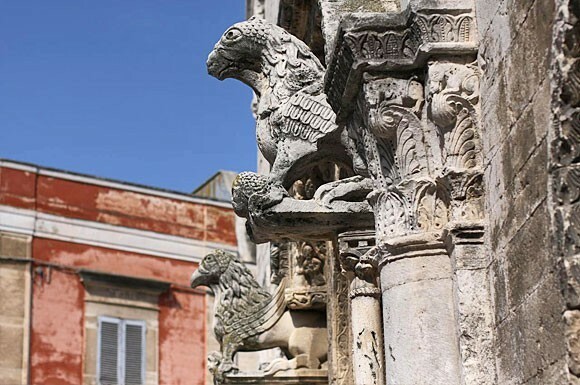 And it was from Corso Vittorio Emanuele that Bari expanded into the so-called Borgo Murattiano, named after Napoleon Bonaparte’s brother-in-law, Joachim Murat, who as viceroy of Naples ordered it to be built. No walk round the old city would be complete without a visit to Piazza del Ferrarese, Piazza Mercantile, the city walls (or Muraglia), St. Nicholas’ Basilica, the Cathedral and the imposing Norman-Swabian castle built around 1130. This ancient seafaring and trading city, where 12th-14th century crusaders once embarked on their way to the Holy Land, now grew, on the viceroy’s orders, with outstandingly beautiful buildings, on a grid pattern with streets intersecting at right angles. Great walks can be had along Corso Vittorio Emanuele, which marks the border between the old city and the Murat quarter, along via Sparano and along Corso Cavour, which respectively house some of the city’s most beautiful buildings: the Town Hall (or Palazzo del Governo) and the Piccinni Theatre; on via Sparano the Mincuzzi building, the church of San Ferdinando and the seat of the University (or Palazzo Ateneo); on corso Cavour, the Petruzzelli theatre (whose refined interior was destroyed by arson in 1991) and the Chamber of Commerce (or Camera di Commercio). 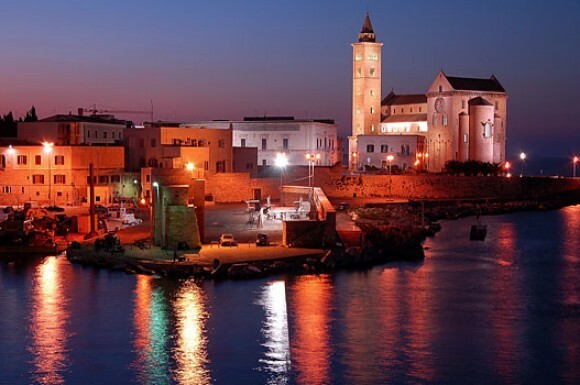 This enchantingly beautiful Apulian city is famous for its Cathedral, a precious Apulian Romanesque jewel and one of the most attractive church buildings anywhere in Italy. 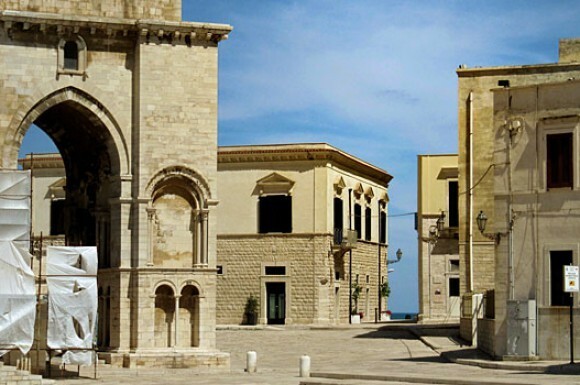 The old city of Trani is full of outstanding churches and noblemen’s dwellings, bearing witness to the city’s illustrious past. 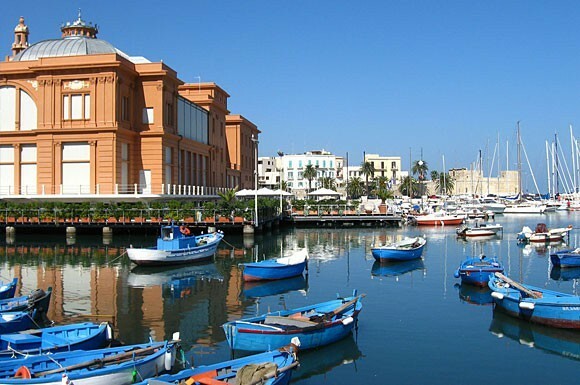 The oldest part of the city is huddled around the port and on a short peninsula, culminating in the Cathedral which majestically overlooks the sea. But the Cathedral is just the tip of the iceberg, as the city has a rich historical and cultural heritage. Crusaders embarked from here on the early Crusades, and the medieval church of Ognissanti served as the headquarters for the Knights Templar; Benedictine friars prayed and transcribed in the monastery of Colonna; the Jewish quarter here lasted for centuries, leaving behind four synagogues; the Swabian castle where Manfred, son of Emperor Frederick II, married Helena Comnenus, princess of Epirus, is an outstanding example of military architecture. As you walk through the city, you will notice 18th and 19th century buildings where noble families visited other nobles in their carriages with footmen at the ready, an experience retold by the city’s Carriage Museum. 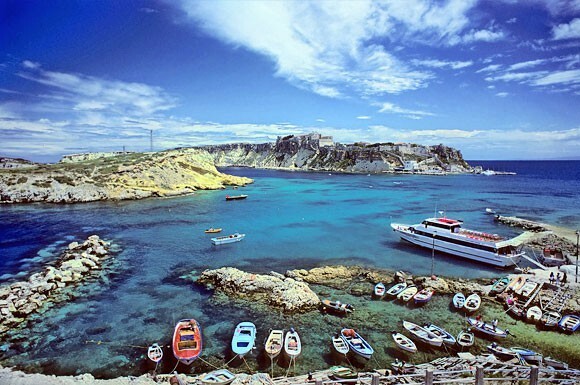 And last but not least are the churches, from Early Christian ones to the Baroque period, an outstanding artistic heritage that can even be enjoyed from the coastline, which provides such stunning views of the city. 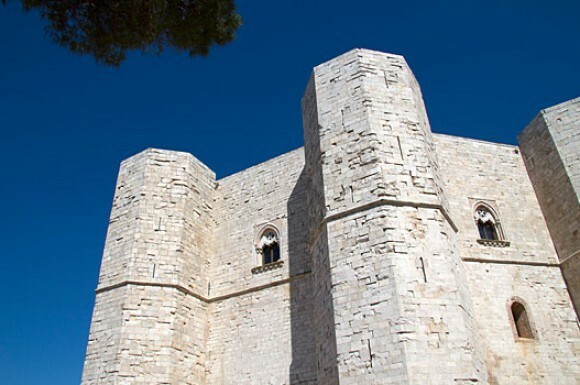 Example of universally recognized splendour is the enchanting Castel del Monte, another UNESCO heritage site, the hunting lodge of Federico II that with its mysterious octagonal mass recently restored to its crystalline state encapsulates the artistic and indefinable sum of an imperial project between the esoteric and the philological. 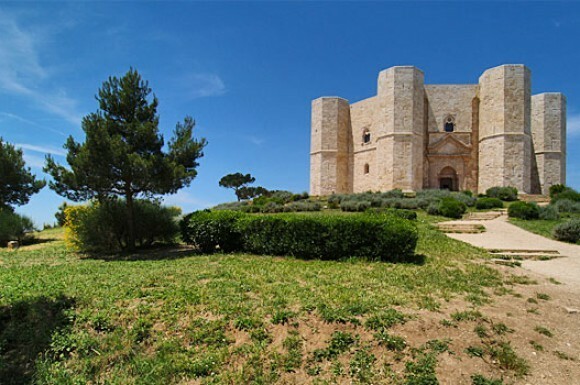 To the south in the province of Bari, near Andria, Castel del Monte stands on a hill 540 metre above sea level. Today it is clearly visible from a long distance. It is unique in its austere regal appearance and looks like a large crown laid on the earth by a supernatural hand. Its construction dates back to the first half of the Thirteenth Century and embodies in its mathematical, architectural and artistic details the intelligence and varied cultures with which the Emperor liked to surround himself. It is not lacking in classical references, preludes to a return to naturalism in the pre-gothic sculptures, indicating its oriental and Cistercian origins. 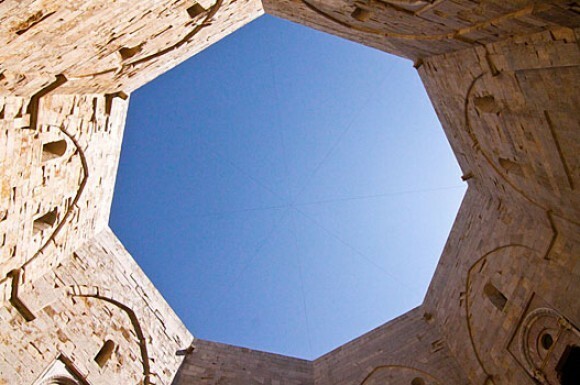 Its structure is truly unique with an octagonal plan and eight octagonal towers set at the vertices of the polygon. The total absence of defence mechanism and cells supports the hypothesis that the castle was not constructed for defensive purposes but simply residential or even esoteric, as it also lacks kitchen facilities. 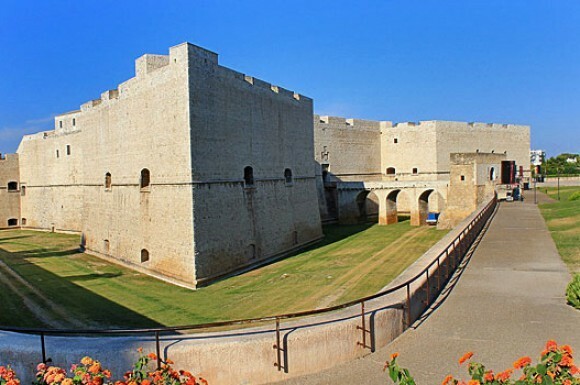 For lovers of history and architecture, Ruvo di Puglia is well worth a visit, and is an excellent and equally interesting alternative to Trani. The road to Ruvo passes through the Murgia hills, providing fascinating views of the stony landscapes which characterise so much of Apulia. 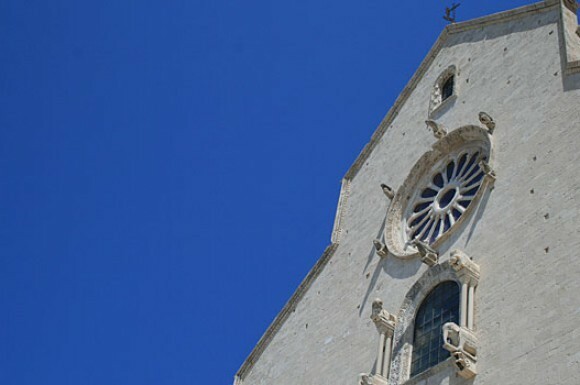 Ruvo also proudly presents one of the best-known and fascinating Romanesque cathedrals in Apulia, with its unusual bell-tower and steep gables which enclose the façade and rose window. A visit to the Jatta museum is a truly memorable experience. The building itself is a living museum, being a 19th century and taken over by the state in 1991. 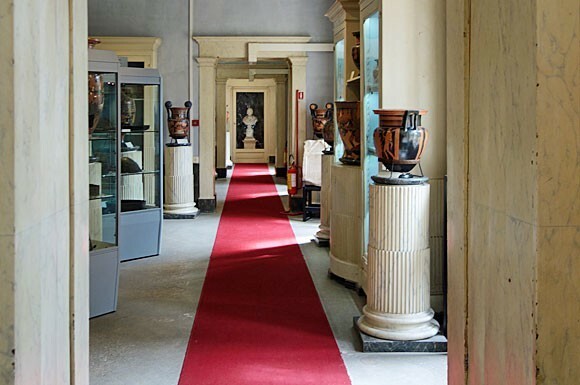 Pride of place in the collection, which uses the original classification criteria, are the ceramics, including local 7th-3rd century BC ones and Greek vases imported from Attica and Corinth. 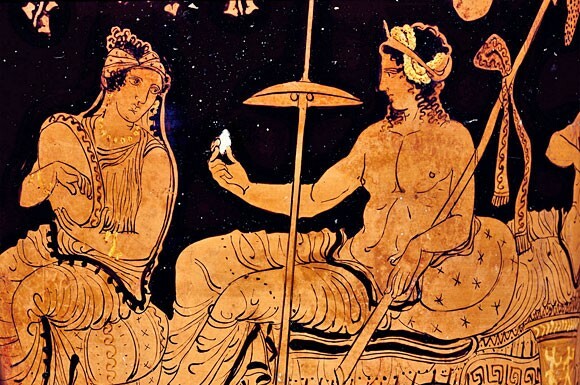 The most important pieces are some of the Apulian amphorae, the proto-Italic krater and anthropomorphic vases. We recommend hiring a tour guide. 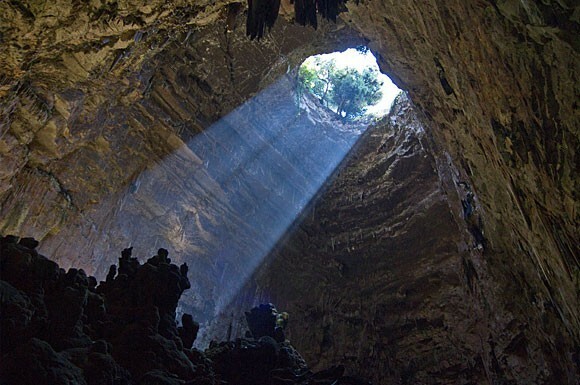 The Grotte di Castellana (Castellana Caves), in the heart of the Valle d’Itria, form the largest and most spectacular cave complex in southern Italy. 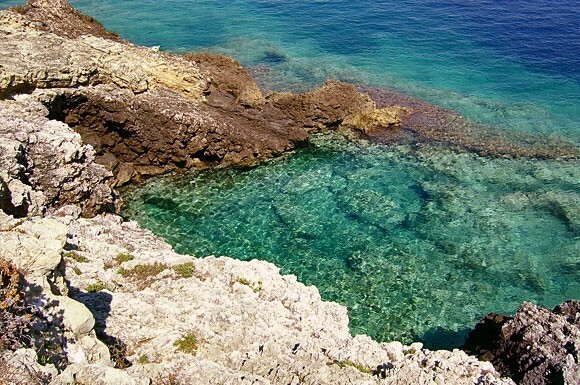 They were first explored in the Eighteenth Century, then rediscovered by Prof. Anelli in 1938 and are now a UNESCO site. 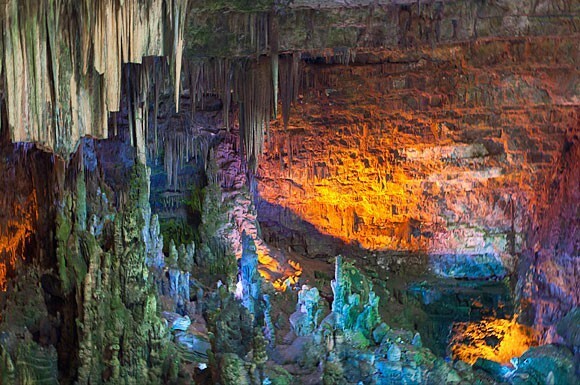 A magical example of karst topography, the characteristic landscape in limestone-dominated areas where there is little or no surface water, because the water is absorbed by the earth, and the rivers flow underground, inside deep caves. 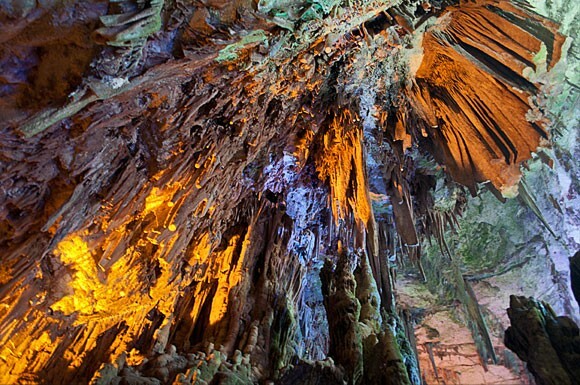 The Castellana caves were formed by the action of one such underground river. 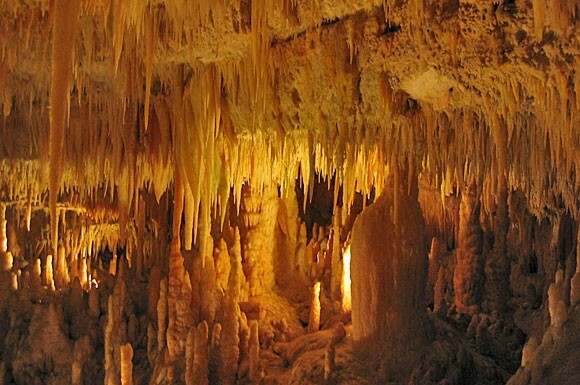 Their unsurpassed beauty is made even more spectacular by the huge number of stalactites and stalagmites which combine to form unique almost dreamlike patterns. There are two different tours, a short one 1 km in length, and the full one which is 3 km long. They leave every 30 minutes from the cavern known as the “Grave” [pronounced “grah-veh”] which lies at the bottom of a great staircase. 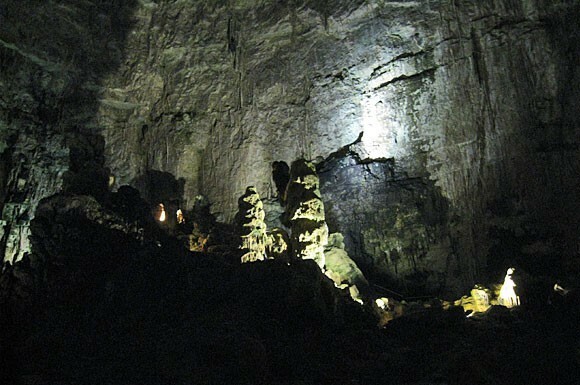 The tours visit caves with such evocative-sounding names such as i Ciclopi (the Cyclops), L’Angelo (the Angel), la Civetta (the Owl), la Cascata d’Alabastro (the Alabaster Waterfall), il Piccolo Paradiso (the Little Paradise), il Corridoio del Deserto (the Desert Corridor), la Torre di Pisa (the Leaning Tower of Pisa) and la grotta Bianca (the White Cave). 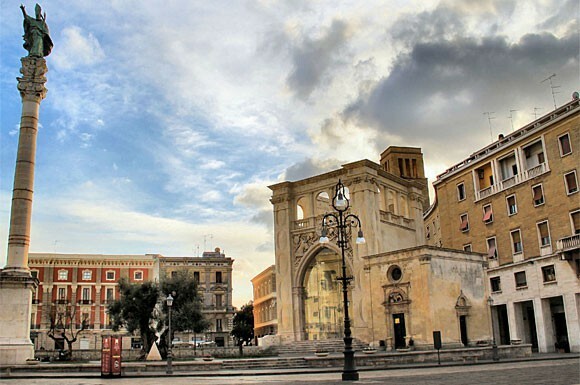 Arriving in Lecce is like being awaited in the salon of a rich seductive noble woman. 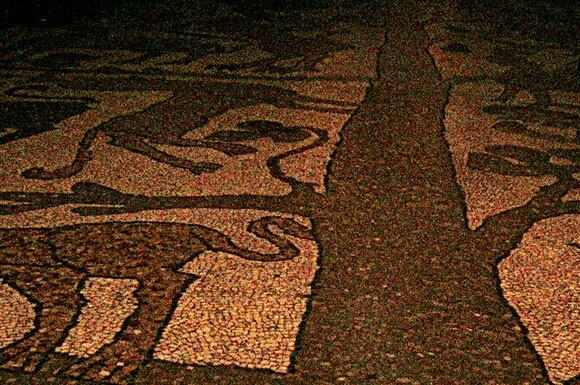 The Latin city of Lupiae cannot forget its classic past. 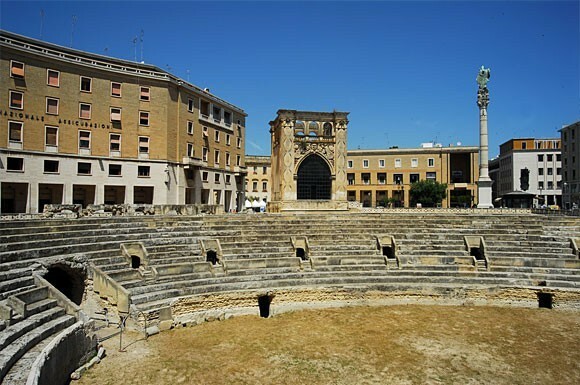 The Roman amphitheatre interrupts the Renaissance and Baroque atmosphere of Piazza Sant’Oronzo where you breathe the elegance of the Lecce of Anjou and Spain in the Palazzo del Sedile, the adjoining chapel of San Marco and the Statue of Sant’Oronzo, standing on one of the columns of the via Appia. 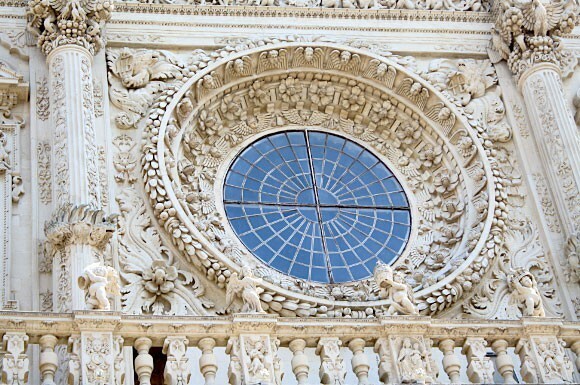 Arriving in front of the Basilica di Santa Croce or in Piazza del Duomo, gives you the sensation of being part of a performance, the musical score of a celebration, of a generous and fertile mother nature. Despite the catechetic dictates of the Counter-reformation certainly obliging them to follow precise canons in the representation of the saints and their sacred works, the tastes of local artists were allowed to reinterpret the works of compassion that the faithful needed. This is true of the paintings and statues inside the innumerable churches in the centre of Lecce. 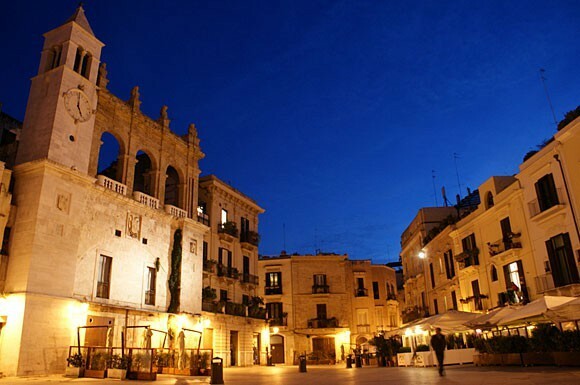 Compact, elegant and mysterious, the capital of the Salento is at its most attractive after sundown, when carefully-designed floodlighting brings out the very best in Lecce’s artistic and architectural masterpieces, which have earned the city the title of the Baroque Florence. There are far too many to mention individually – civic buildings, churches, monasteries and squares abound, tiny treasure troves to discover in the old city, all built from the same soft local white stone which takes on a characteristic golden hue as it comes into contact with the air. 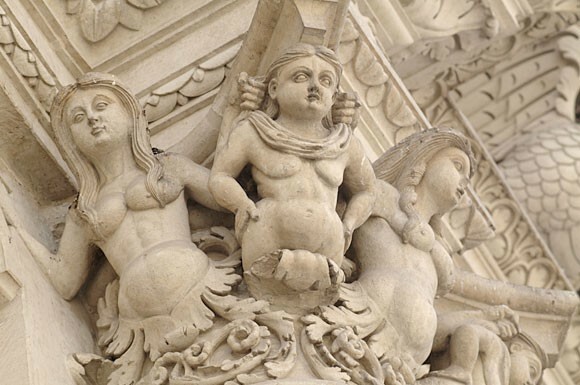 Being easy to work, this limestone is the key to the originality and diversity of the Salento Baroque, which is markedly different from the corresponding forms found in Rome and Naples, for example. 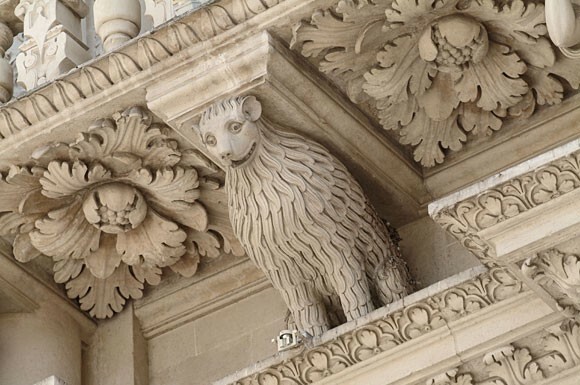 But Lecce’s historical and artistic value dates back much further than the Baroque. As the Classical Roman theatre and amphitheatre show, the city enjoyed many other periods of glory, and ever since it became a trading power allied with the mighty Venetian Republic, it has grown in stature year by year. 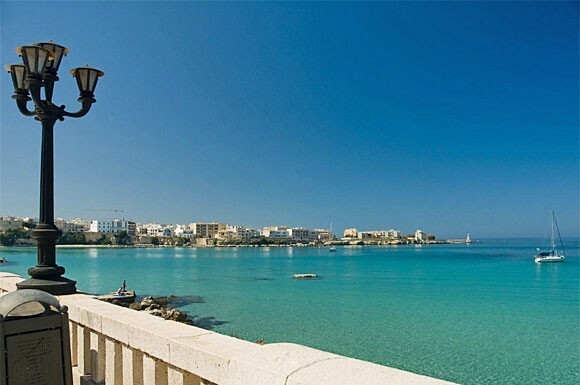 The trip from Otranto is a must if you want to live and breathe the air of our orient. 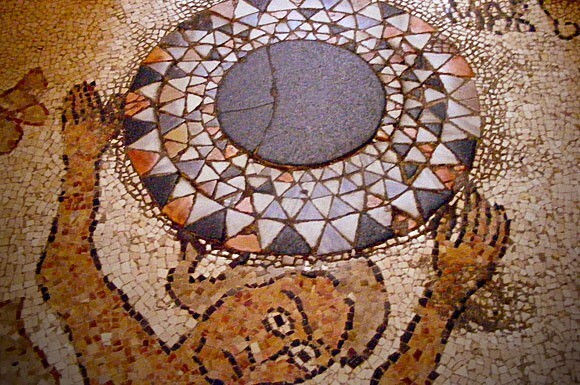 The ancient Hydrunptum was a Messapic city and then a Greek and Roman centre, but its links to the orient were affirmed during the Byzantine époque when it became an important religious centre. The cathedral, that was only finished in the second half of the Twelfth Century, bears witness to that past and was the reconstructed after 1481. 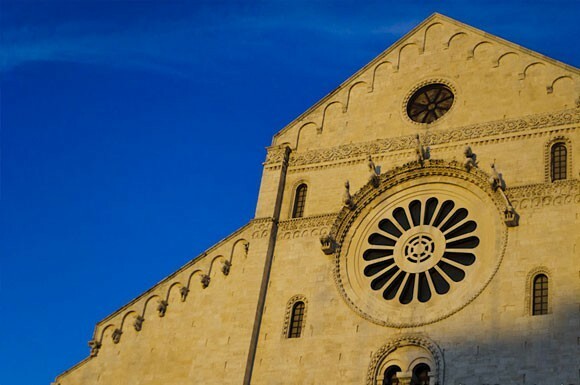 The story of the massacre of the eight hundred Idrontini occurred in July 1480 by the Saracens and has never left the memory of the city that dedicated an entire chapel to them in the right apse of the Duomo. 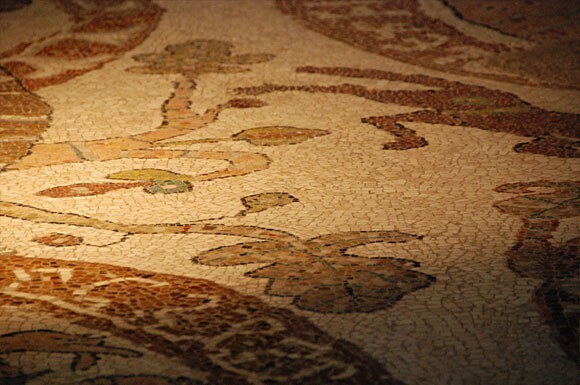 Entering the church takes the visitor into a biblical, mythological and astrological world narrated by the magnificent mosaic floors. Here the history of man, of sin and redemption through work and prayer alternates with even more mysterious symbols, imaginary animals speak of a not always understandable nature and a truly dismal vision of hell. Outside, with the sun playing on the rocks, the world appears to been released and to enjoy the smell of the sea, alternating with that of the culinary delicacies that tempt us from the windows in the alleys. Many tourists are attracted every year by the leather workers, potters and stone masons. 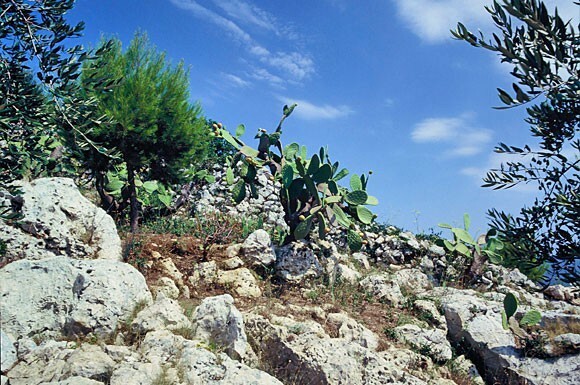 The rocky scenery slopes down to the golden beaches of the Gargano, known as the Spur of Italy, that since 1991 has been a National Park containing an enchanting example of Macchia Mediterranea (of which the Aleppo Pine is an excellent example). To the North of the promontory the slightly rolling countryside is varied and iridescent. The coast is low and sandy, the sunsets are spectacular and beautifully reflected in the Lago di Lesina, one of the largest lakes in Puglia together with the Lago di Varano. The lakes are in fact more like coastal marshes fed by subterranean and marine springs that make the water brackish and rich in eels. 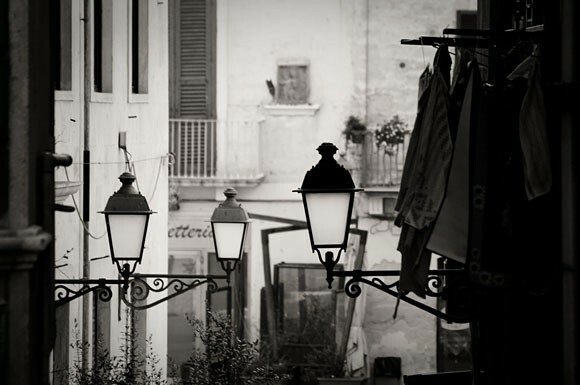 The land changes again following the rise of the promontory where the villages are set like pearls on the side of the rocks, dominated by the white of the houses in the narrow and silent alleys that suddenly open up onto piazzas, small courtyards and Medieval churches. One very interesting excursion is a visit to the Foresta Umbra, large stretch of green forest containing high beeches and maples where if you are lucky you can also see roe-dear. 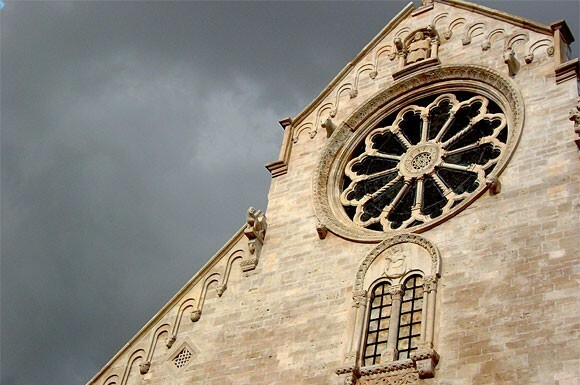 Further up a mystic atmosphere welcome visitors to one of the higher villages, namely Monte Sant’Angelo, with its famous cave shrine dedicated to the Archangel Saint Michael and its Medieval castle that looks like it belongs on a Nordic film set. 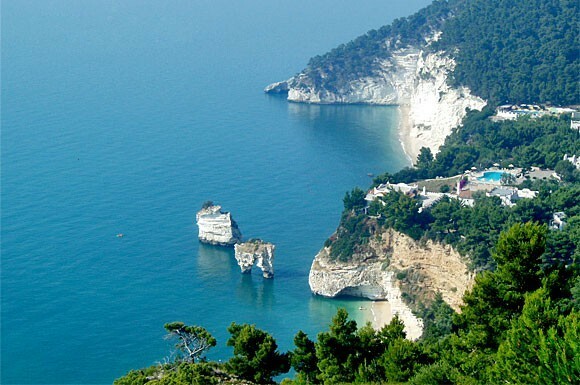 From up here the sea calls us again and our gaze shifts to the well known Peschici, Vieste and Mattinata where eating seafood and enjoying the clear bright waters that play between the arches and lime stone cliffs seem to be the favourite sports of tourists. 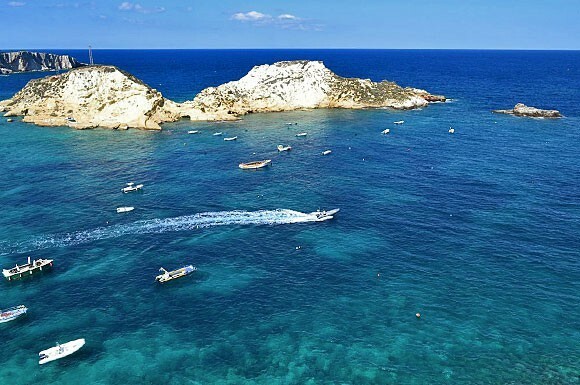 Just over the horizon are the Tremiti Islands of San Nicola, San Domino and Capraia, whose jagged coasts abound with inlets and marine caves with various names such as Grotte Viole (Violet), Grotte del Sale (Salt) Grotte del Bue Marino (Sea Bull) and Grotte delle Murene (Morray eels). 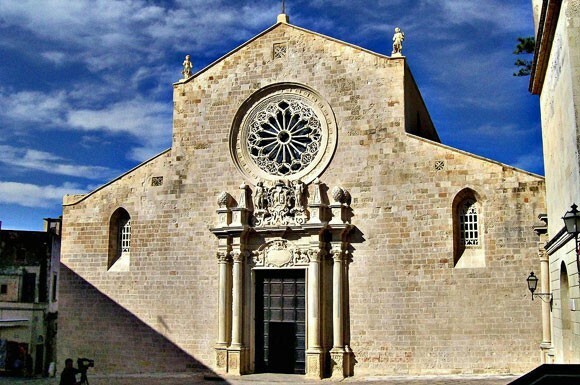 Art lovers should not miss the beautiful Abbazia di Santa Maria al Mare, a Benedictine Abbey founded in 1045 on the Island of San Nicola. 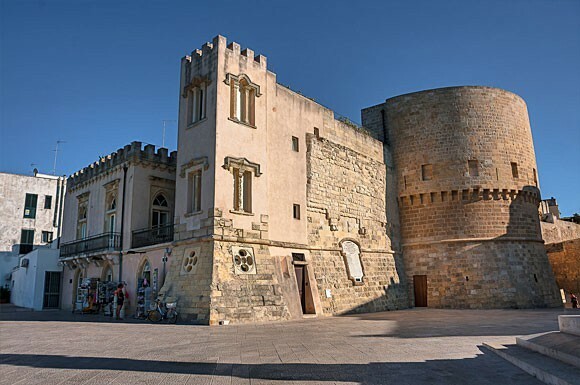 The port city of Manfredonia also offers a chance to step back in history at the Castello, with its important archaeological findings, founded by King Manfred and completed by Charles I d’Anjou. 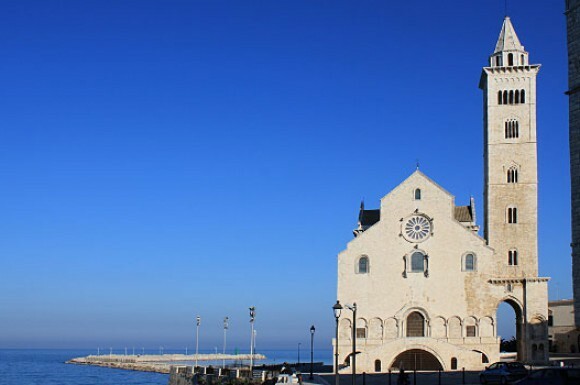 Two kilometres further on we come to Siponto that completes this artistic tour, offering tourists another two examples of the Romanic in Puglia in the Santa Maria Maggiore church and the San Leonardo Abbey. 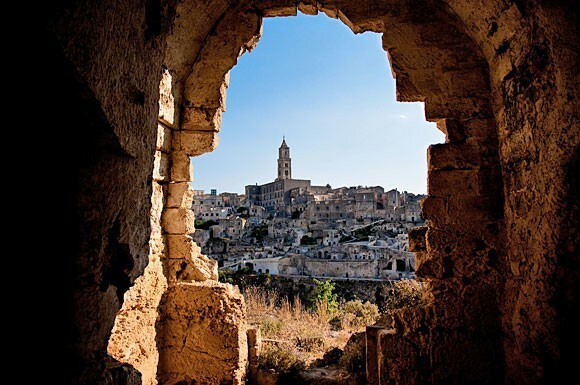 The visit of the noble Matera should start from the densely packed ruins of the Sassi (excavated caves) that have for centuries been a symbol of man’s adaptation to nature, through habitations and churches at the dawning of Christianity. The rocks of this land subjected to atmospheric agents and subterranean faults have often led to the formation of caves which act as occasional refuges, but also as real family dwellings, places in which to pray, celebrate and bury the dead. 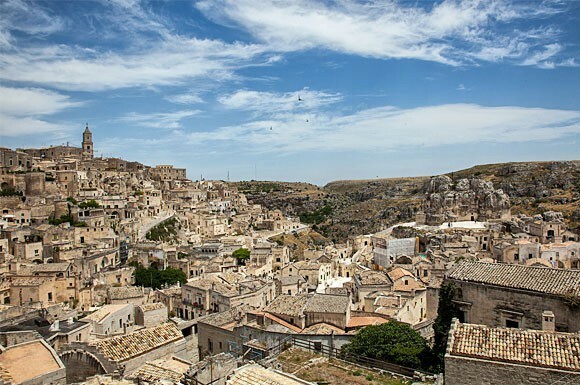 The living archaeological jewels of Basilicata, the Sassi di Matera (Matera Caves), a UNESCO site, are noted for their exceptional forms. From prehistoric times onwards, there has been a progressive organization into villages consisting of real habitats complete with their mystic and religious aspects. The upper city truly seems to be the heir to a story born below, between the rocks. From the Eighth to the Thirteenth Centuries it became a refuge for monks, persecuted by the iconoclastic furore. Successive settlement was by groups of peasant farmers who abandoned the nomadic life and chose to inhabit and adapt the caves, excavating rooms in the rocks and enlarging niches into living spaces. The caves form two large zones that face each other. 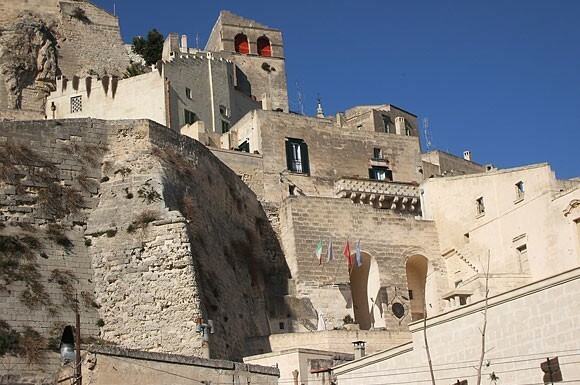 The Sasso Baresano, towards Bari and the Caveoso towards Montescaglioso, separated by a large spur, the ancient settlement around the old cathedral, both oriented towards the sheer karst cliff cut out by the Gravina stream (the term “gravina” in Puglia and Matera historically indicates a sheer cliff cut into the rock).